Then… Suki. Oh, Suki. The packaging was a pleasing yellow, and I was immediately drawn to the smell. It smells clean, like hibiscus: fruity and fresh. The cream itself is sort of foamy and very rich. It reminded me of yellow cake batter. Ain’t nothin’ wrong with that! I dabbed my ring finger in, and applied some to my eye area – pat, pat, pat. I waited for a reaction. OK, this is nice, it doesn’t sting, I enjoy the smell, and I can really start to feel a tightening effect. Oh wait, tightening? This is new. I have been using oils around my eyes for so many months now that the consistency of the Suki eye cream threw me off. I felt around my eye: yes, nice and moisturized…ahhh…and this sensation of tightening was lovely. I have been using Suki in the morning, and my eye cream at night. It’s been proving to be a really good combo for me because the Suki is lighter than the oil in my DIY eye cream, helps my eyes feel “awake,” and works really well under make- up. Over the past two weeks of using it, I’ve felt an immediate change in my skin. I feel the skin around my eyes looks more taut. 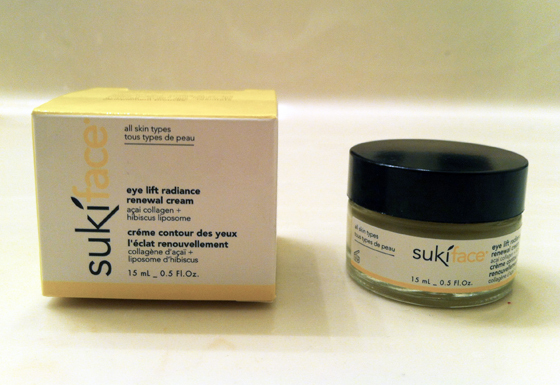 Even after a late night or lack of sleep, in the morning, I feel like the Suki eye cream really helps me look rested. It has a cooling effect on my eyes, which is really nice in the early a.m. when I hate everything. I feel luminous and free of puffiness. I wish I would have found Suki sooner, because despite what many high-end brands claim, I feel like Suki Face has actually really lived up to their assertions! I am spending no more on Suki than I was on the “toxic” creams I was buying from the beauty counter of Macy’s or Sephora that contained parabens, sulfates and sodium benzoate. Suki, I think I am hooked. Now that I’m on the natural product bandwagon, I’m convinced that I can have pretty, preserved, and supple skin in a safe and NATURAL way, and that I really, really do not need the junk that is marketed to us through TV and glossy magazines. Can I just saw I’m right there with you. Eye cream, mascara & deodorant. I know what a list, but some of the more difficult items as you say to be “unsullied” successfully. Might have to add this to my list to try after I empty what I’m currently using even though so far I’m happy with it (Acure Organics). I’m always up for a change as long as it doesn’t burn my eyes I’m sensitive as well. I once had a well known “fancy pants” brand sting the hell out of my eye area and was none too pleased.